Once during your turn (before you attack) you may move an energy card from 1 of your Pokemon to another of your Pokemon. 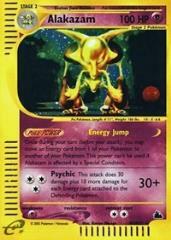 This power can't be used if Alakazam is affected by a Special Condition. This attack does 30 damage plus 10 more damage for each energy card attached to the Defending Pokemon.